Blackhawk Shooting Sports has officially broken ground! Despite some grey skies and the occasional rain drop, site work has begun. We’re currently on schedule for a grand opening in early 2017, so stay tuned for updates as we get closer. We’ll also be sharing construction updates as we go. We’d like to send a special thank you Keller, the talented architects and builders on this project. Blackhawk Shooting Sports will be a state of the art indoor handgun range and training center, located just off of Highway 43, in Oostburg, WI. We’ll be offering various training sessions, classes, competitions, and leagues, all in the comfort of a beautifully designed, modern range. We’re building this range for people just like you, so we’d love to hear what kinds of experiences you would like to enjoy at Blackhawk. Take our short survey, let your input be heard, and enter for a chance to win some great Blackhawk prizes! 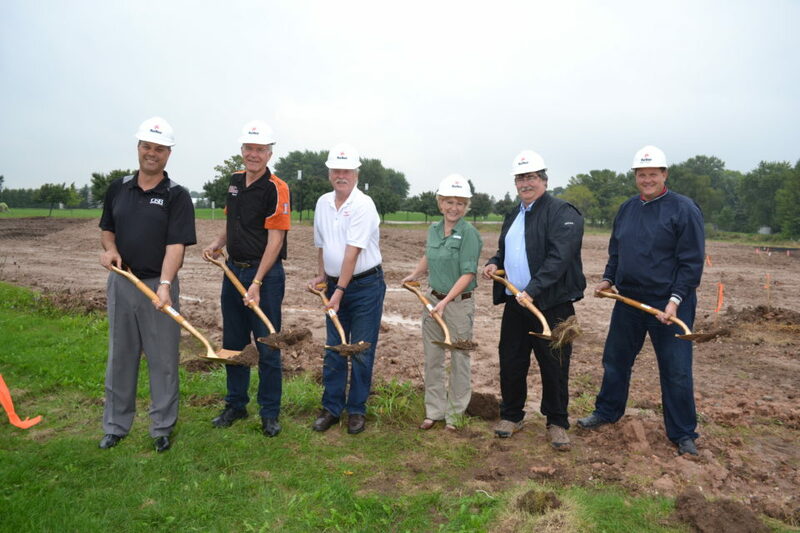 From left to right: Eric Glewen, Vice President Oosburg State Bank, Allen Wrubbel, Oostburg Village President, Terri Duenk, Dr. Jeff Duenk, Bob Poch, General contractor Keller builders.